I love Eugene T. Mahoney State Park, but I’m most familiar with the park in the summer. 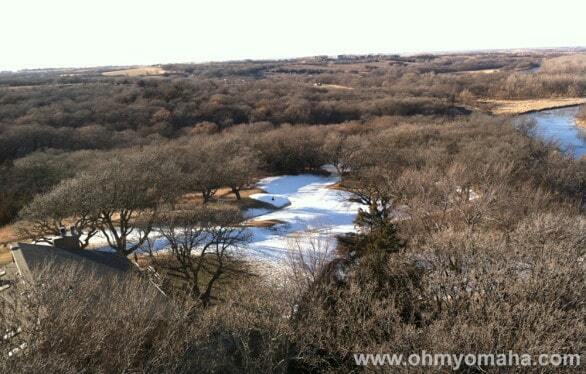 We recently visited on two unseasonably warm winter days and discovered a whole other side to the park. Turns out, it’s worth a visit during the winter, especially with kids. I hate being cold, but even I love visiting Mahoney State Park in the winter…on the rare days in January when the temp is above 40. First, the indoor stuff. This is my favorite since I hate being cold. One must-visit place is the Activity Center. Why have I not been here sooner with the kids?! 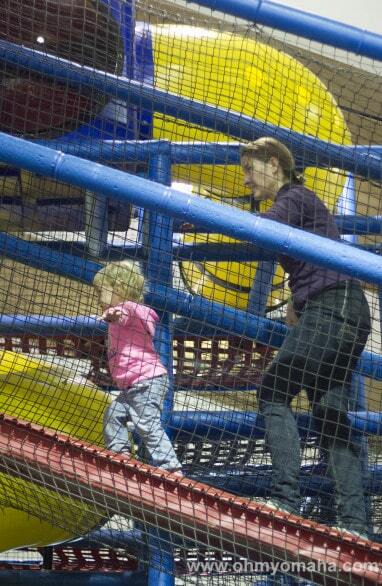 For $2 each (FREE for kids 2 and younger), you get endless play on their indoor playground. It’s pretty sweet, even for a grown up. Don’t be shy, put down your smart phone and get in there and play with your kids. It helps if you were a former Chinese acrobat or retired contortionist, but don’t worry, you’ll make it through those tubes somehow. Helping Mooch conquer the Activity Center play area. It gets a little hectic in there, so I don’t mind playing linebacker for her. The Activity Center also has an outdoor ice rink, with a $3 skate rental fee. If it’s fairly warm, part of that rink melts (duh), as was the case on the day we visited. Not a far walk from there is the conservatory/greenhouse. 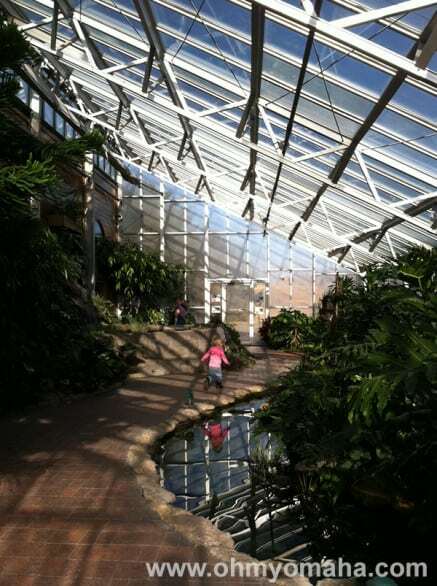 Exploring the conservatory at Mahoney State Park. This is a great place for a quick warmup if it’s particularly freezing outdoors. It’s like 150 degrees in there. It’s small but there’s a lot to look at, including a fish pond. 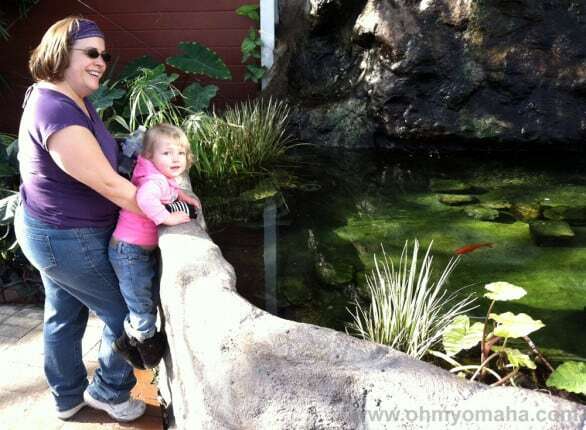 Aunt Amy and Mooch check out the fishies. 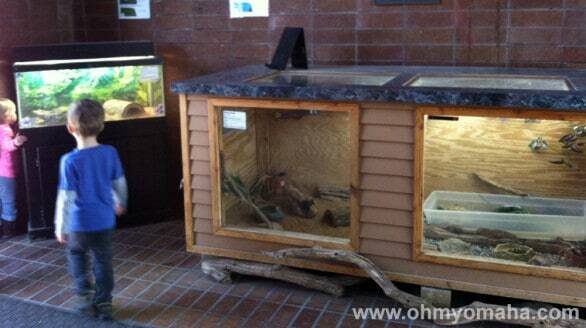 In a separate room, there are a couple aquariums featuring native Nebraskan animals, like snakes and a turtle. The kids liked looking at them. Some native species of turtle and snakes on display at the conservatory. The park has moved the arts and crafts center over to the marina. We didn’t visit it on that particular day but signs indicated it was still open. The other indoor activity I recommend for kiddos is the junior naturalist place up by the lookout tower (lower level of the building). I peeked in and they were offering warm drinks along with some coloring, the afternoon we were there. There was also a sign of other activities you could do, like a scavenger hunt. A view of the toboggan run at Mahoney State Park. A big outdoor draw at the park is the toboggan run. On the warm day we were there, people were still trying to sled down the big run. It’s a pretty nice, long hill but not too steep, with bales of hay protecting sledders from trees and other danger spots. The sledding hill is right by the lookout tower. I can’t imagine it’s a nice climb on really cold days, but it was not bad when we walked up it. The trails near the tower were not too muddy, so we also checked them out. 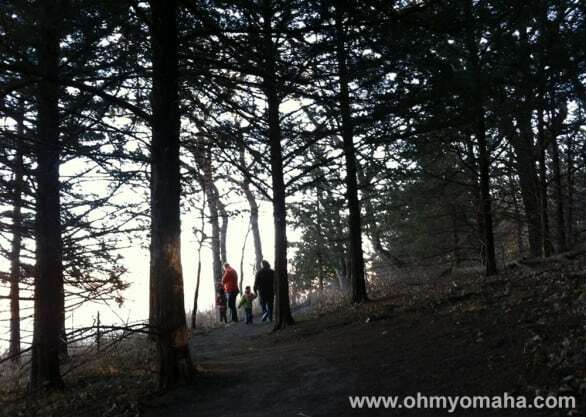 Exploring the easy-to-hike trails near the lookout tower. If you time it right, you can catch a nice view of passing trains. While I prefer my hikes when I can feel my fingers, trails are still open at Mahoney in the winter. 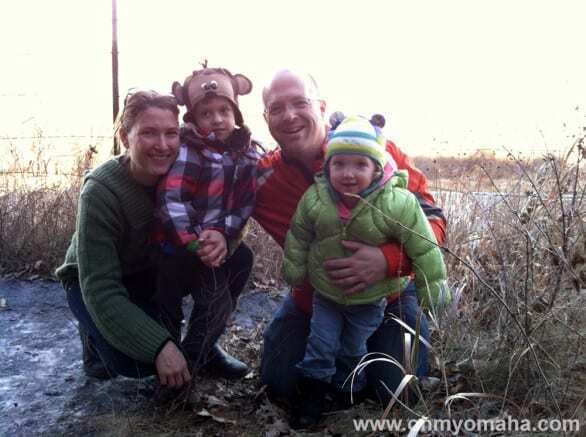 My kids slept 12 hours straight after our visit to Mahoney in the winter. I’m sold on visiting parks in the winter now. We’re smiling because we know these two monkeys are going to sleep well tonight. My kids loved the Activity Center so much, I’d even make the drive out to Mahoney just for that. Activity Center hours: Monday, Thursday and Friday, 4 to 8 p.m.; Saturday, 11 a.m. and 8 p.m.; and Sunday, 11 a.m. to 6 p.m. Closed on Tuesday and Wednesday. 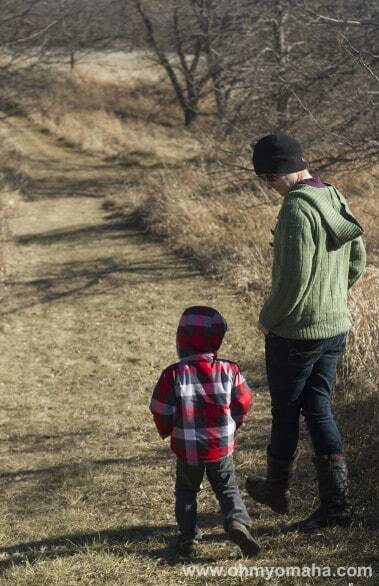 Your turn: What’s your favorite thing to do at Mahoney State Park in the winter? I LOVE Mahoney! Next time you’re there, eat at the lodge. 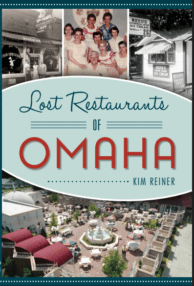 It was formerly a plain ol’ restaurant (but with stunning views of the Platte). In the last year or two it changed hands and is now a BBQ joint. Mahoney is one of my favorite places in the area to visit. Not sure if this stems from all the great memories here, from holidays to (my) birthdays to morning excursions with family or friends, but it’s always nice to visit. My dad and I brought our bikes one time and road around; ate and played mini golf. Another time we hiked the trails and waiting for the trains to push by. The lodge now serves BBQ?! I didn’t know that. I’m looking forward to my kids being steady on a bike so we can ride around the park someday. good memories lie ahead. I’ve only been there during the summer to. 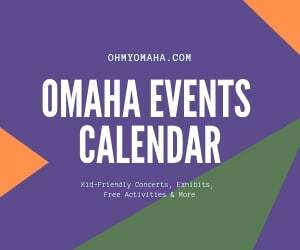 We should check them out on a winter day. I was surprised by how much there was to do there. I’m definitely a fan of summertime at Mahoney, but it’s really nice this time of year too.